As someone who experienced a couple years of the early retirement movement, I’ve noticed a growing trend to forsake owning for renting. Commonly cited reasons are cost, flexibility to move and potentially higher returns elsewhere. Goodness forbid owning a house as a startup founder. Egad! While all these reasons for renting are completely valid, if you are renting and hardly ever travel, aren’t investing your disposable income, aren’t running a lean startup, or staying at the same job for years, you’re actually negating all the benefits of renting. You might as well own! Being neutral the property market by owning a primary residence allows you to sidestep inflation’s never ending beating. Most of your costs are fixed, and if you ever decide to rent out your property, you’ll begin to capture the benefits of inflation. Most of us don’t count on Social Security to be there for us in retirement. Expecting the government to take care of us, when it can’t even take care of its own finances, is a dangerous thing. Check out the survey below to see how independent most of us are. We also realize that if Social Security is there for us, then we might all be millionaires by the time we start collecting. Just in case we fail at becoming completely self-sufficient, Social Security is a powerful security blanket. For investors in general, it is difficult to envision a $500,000 tax-free profit on your investment. However, if you own and then sell your primary residence, you can. Especially if you’re married and live in higher cost areas like New York City, San Francisco, Los Angeles, San Diego, Seattle and even Denver. If you live in less costly areas, you can still envision the chance for a meaningful tax-free return upon the sale of your home. But just like Social Security, even though we don’t count on having $500,000 in tax-free profits (for couples) sometime in the distant future, it’s nice to know that we have such optionality if the possibility ever arises. There’s no other asset class I’m aware of that allows for $250,000 (single) / $500,000 (married) tax-free profits upon sale. 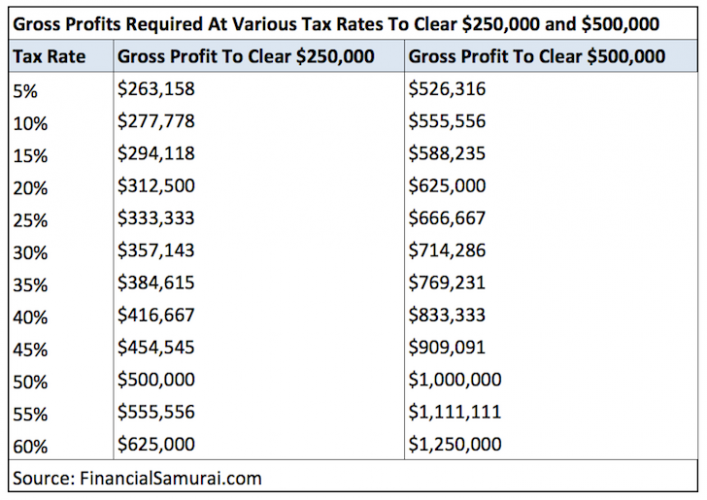 Let’s visualize how much gross profit you need to make at various tax rates in order to clear $250,000 and $500,000. As you can see from the chart, the higher your tax rate, the more beneficial it is to own real estate as an investment. If you have a Federal tax rate of 28% or higher with itemized deductions beyond the standard deduction level, then you’ve got another reason to own. Given that time tends to make asset owners wealthier, those who plan to hold their primary residence for longer than the median seven years will likely find this chart even more compelling. 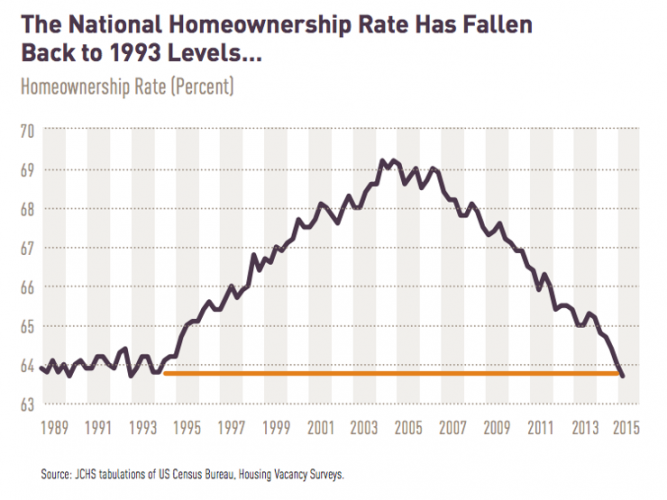 What’s going on with homeownership rates? We can debate about the actual financial costs / benefits of renting vs. owning until the cows come home. However, because there’s so much at stake, each side will always think they’re right. Thus, I’d rather discuss the perception that renting provides more freedom than owning. Unless you’re a digital nomad, most people live in one area for years with only two to six weeks of vacation a year. If you’re one of these people, then the perceived benefit of having more freedom is negated. If you’re an owner, it’s not like you can’t travel for months on end either. I traveled for six weeks a year my last three years of work between 2010 – 2012, and I’ve traveled for 10 weeks a year between 2013 – 2015 so far. As for expenses, your mortgage payment is automated and you can easily pay your property taxes online. If you are a landlord, you can hire a property manager for half a month’s rent to manage all the go-betweens. You can utilize Airbnb or find a subletter through Craigslist to cover your costs or make some money while you are away. There are even companies like Handy who’ll clean your house or fix whatever is broken through their mobile app. Thank goodness for the internet! Rent or own, your life will be what you make of it. If for some reason you can’t get neutral the property market by owning your primary residence, then be disciplined enough to save and invest all the money that would have been invested in a property. Sam – I’m looking to buy an apt in NYC. In your opinion, is it better to have 1) among the more expensive unit in a relatively affordable building, say a $2M unit where median price is ~$1M or 2) less expensive unit in a high end luxury building, say $2M unit where median price $5M. For sure option #2! You want to attract surrounding buyers who have much more to spend, who can always downsize. They have the optionality. If you buy a $2M place.. the buyers of the $1M places don’t have that same ability to go up 100% in value. Thanks! Great point and something I haven’t thought about, among many pros to #2 I think, including it would likely be in a more desirable area seeing the building and location has been proven to command many investors and buyers. W/r/t #1, the only pro I could think of was the stand-out factor and relative attractiveness of the unit vs. others in the building. Unfortunately, New York City and some other areas have serious constraints when it comes to investing in real estate. In particular, the vast majority of apartments in NYC are co-ops, not condos. And 99% of co-ops have restrictions on subletting/renting out the property. In most cases, after purchasing you can rent out your place for no more than 2 years, and the rent is regulated by the board. Another factor that most RE investors do not take in consideration when planning to buy in NYC is maintenance fees. In some areas of Manhattan, monthly maintenance (aka HOA fees) can be as high as 2k a month per 2-3 bedroom apartment, and the fees tend to rise over time, especially if co-op/condo is built on a rented land (yep, sometimes the building does not own the land). I guess in SF and California these are not the case? Sorry, forgot to elaborate on maintenance fees: the point is that even after paying out the mortgage, you will end up paying monthly fees that amount to 50-90% of the rent in other parts of the city. But those fees include property tax right? We have HOA fees and property tax here in SF, CA for sure. But you are right.. the ongoing maintenance costs and fees are a big negative for real estate! As usual, the most important metric for owning vs renting is not mentioned. It all depends on the sale price to rent ratio, just as a business’s valuation depends on the earnings to price ratio. If you are in a market where owning is actually cheaper than renting on a monthly basis, unless you expect the area to completely fall apart in the next decade, it’s nuts to rent. On the flip side, in NYC, I can rent for $5k or own something similar that costs about $10k per month ($2k of which are for co-op or condo fees, which are essentially similar to rent as they are inflationary expenses and go on in perpetuity). It’s hard to justify buying when the same property is double the monthly cost with 20% down. I can definitely make much more money somewhere else. In fact, if you take the $400-500k downpayment, you can easily buy a business which nets you $100k per year, which will pay that rent forever. In fact, that is conservative, and you can likely make much more if you know what you are doing. That was interesting. Here in Canada, we can get 100% tax exempted on primary residence only but capital gain taxes to be charged on sale of non-primary residences. Housing is one of the best investments that an individual can have to hold which will gain gradually in a more safe manner than other assets. Thanks for sharing! That is incredible. No wonder why the Canadians are so in love with housing. Just as the real estate market goes in cycles, so do the voices of the rent vs buy groupies. Right now it seems like the “trend” is for people to rent, but it depends on a lot of other factors like your current financial situation and the market conditions in your area. I read quite a few personal-finance blogs and would have to say that a lot of the material and investment views are agreed-upon except in the area of owning a personal residence. I would love to see Sam go head-to-head with Go curry cracker who adamantly opposes owning your own home. Yes, see this was my point from the intro of my article. It’s good they rent because they are nomadic. For most people, they are not as nomadic, which negates some of the benefits of renting. Also, the wealth levels are different. Not to get into specifics. Even when they were not nomadic he still makes opposing views to owning a personal residence. From a financial perspective I think renting makes more sense but from a personal lifestyle perspective owning is by far the best . Everybody has their own decision to make. Whatever decision we do make we will espouse. That is human nature. If we are to be objective, then I behoove people in the highest tax brackets to get neutral property by owning their primary residence at least. May I ask your age and current living situation to understand where you are coming from? This is an easy one though, because I agree with Sam. If you aren’t investing your disposable income (and most of it is disposable), then you don’t have much of a financial future. Maybe the forced savings of a mortgage is for you. I would still prefer stocks over single family homes or condos. AAPL, GOOG, and FB will outperform any house in Cupertino, Mountain View, or Palo Alto, and with stocks you don’t have to spend your weekend painting and mowing the lawn. +1 on the dumpling eating contest! How do you propose long term capital gains as being tax free? An interesting loophole maybe…..
Haha, that’s awesome. I can inhale soup dumplings from DTF! Donno who will win! Great post. I’m on the verge of buying a house in the Bay area, and regretting not doing it earlier. I’ve been waiting for the housing market to cool for years, but now I’m at a point where I’m just sick of paying the outrageous rent here (although I do have rent control so not necessarily hurting from inflation, but rent is still uncomfortably high). Given your thoughts on the housing market cooling off, if you were in my shoes and thinking of buying a home as your primary residence, would you go ahead and buy now or continue paying absurdly high rent while waiting for the housing market to cool over next year or two or three? Any advice?! Thanks again! What’s your rent? And are you happy with what you have? If my prediction of real estate comes true, you will only have at max 2 years of appreciation before coming back down to where you started and maybe lower for years. Hence, the key variable is LIFESTYLE. Buy a place where you could see an improvement in lifestyle. Bc that’s what matters most. Also, if you are to buy, please do so with at least a 10 year holding period in mind. Rent is ~$3,600, and yes we love apartment and would never leave, although we would like an additional bedroom and would like to cut turn the rent expense into equity by buying a place… If we move, it would not be much of an upgrade, potentially a downgrade. We wouldn’t be buying for an upgrade in lifestyle, but more as an investment so we’re not throwing away $3,600 every month. Even assuming 0% appreciation on house, wouldn’t you think we’re better off with a mortgage as opposed to rent expense because we can get tax break plus accumulate equity? FWIW, I’m in the same situation. We’ve got a 2BR in one of the most iconic old-SF neighborhoods, rent controlled, paying 3.2k/mo. My approach has been to spray and pray as Sam says, making offers on homes that make sense financially and that I’ prefer long-term to our current apartment. So far, no dice, but that’s much better than over-paying in a bidding war with some corrupt Chinese government official playing with funny money. You don’t want to be the one holding the bag, stuck in a house that you can’t sell and that you don’t like, like all the folks who bought at the peak of the last cycle. This market will correct when the VC funding dries up, questionable companies start going under and foreign money dries up. As a bay area native, I’ve seen it 3 times in my lifetime and it will happen again. Invest your money elsewhere, keep saving and make offers when its a place you feel good about at a price you are comfortable with. Spray and pray, I like it. Not sure if the RE market in NYC, particulalry certain parts of Brooklyn will cool down any time soon. Asians are continuing to grab properties cash as if $1 mill in cash is child’s play. Plus you have the Yuppies who want to work in Manhattan and live in the surrounding Boroughs. Rents have been increasing by the month, and even if you are willing to pay, you will be lucky to secure one as someone has already beaten you to it with a deposit. To top it off, you have the Orthodox Jewish community ever expanding and extending its traditional territories, not to mention paying above market prices to take properties. I see the continous expansion of the Orthodox Jewish and Asian communities in Brookkyn, and therefore dont worry much about property values going down. As Sam already pointed out, the least you can do is be neutral to inflation, especially in places like Brooklyn where rents are sometimes completely at owner’s discretion. I say all this because I am buying in BK now, and plan to buy in Staten Island in the future. Being in the hot California market my primary concern is China, and when will all the cash offers from Chinese trying to offshore their profits into California real estate dry up. Our current economy has to give somewhere, and when it does, the ramifications are going to be reaching far far beyond real estate. Supposedly, there is now even more China hot money buying US real estate after this year’s stock market correction. Let’s see how long this flow lasts. I love real estate as an investment. My goal is to purchase 4-6 properties per year around my surrounding area(in California’s Central Valley). I am about 3.5 hours away from you Sam, 2.5 hours North of LA, and 2 hours East of the Central Coast. I do a lot of “Spraying and Praying”, as well as buying from wholesalers and other investors. The strategy that is working the best right now is the BRRRR strategy (Buy, Rehab, Rent, Refinance, Repeat). After rehabbing the property and renting it, I can get most or all of money back through a cash out refinance to repeat the process. I usually have an instant 30% equity once it is appraised, which I love because I can realize a 30% market drop and still break even. The rents I receive are usually 2-3x the amount of the mortgage on a 30-year fixed loan. So far I have closed on 4 properties this year and am hoping for a 5th by the end of the year. My goal is 100 properties by age 50 (I am 27 and currently own 6). I also own my personal residence. It does not make much sense for me to rent in this area since I am here for the long run. Sounds s like you frequent Biggerpockets.com? That’s the only place I’ve seen BRRRR. I’m in my mid 20’s and so for my situation, having a paid for home by the time I’m 40 will be huge in terms of limiting monthly expenses and getting my FIRE age down to my mid-to-late 40’s. I understand it’s different in high COL places, but in places like TX, what’s the argument against buying unless you need that capital to fuel a business that is generating massive returns for you? Sam – do you think corporate tax rates have a chance of decreasing and if so, wouldn’t this greatly change the conversation in terms of profits and overall economic viewpoints. Obviously, we don’t want to get muddled with hypotheticals, just curious on your thoughts. The tax benefits of real estate ownership, including home ownership, are hard to overstate. I bought my first property while I was in law school and sold it for tax free gains just before the recession hit home prices in that area. Then I waited a while and started buying rental properties at the depth of the recession, which now could cover my entire COL, but since I have a day job I’m instead saving the profits for the next opportunity. The rental properties will likely increase in value over time as they provide current cash flow (so I’m not screwed if I ever get fired). Depreciation and deductions off-set the income they generate. If I really needed to get some cash, I could always get a mortgage against one of the rentals to harvest the equity without having to pay taxes. Similarly, I recently bought a town home as a primary residence in a desirable location with a 15-year term loan that I’m on track to pay off in 10 years or sooner. Not having a home payment while I’m still young (or if I upgrade housing someday, having all the cash flow the town home generates) will offset any deficiency I have in my toddler’s 529 plan, and after his school is done, it’ll be more tax-free $$ to spend traveling the world in early retirement. So yes, big fan of real estate, largely due to the great tax advantages. Whether renting or owning is the best option really depends on where you live. Betting on capital growth of a home is a risky play. It can pay off, but equally many people sacrifice a lot to own a home (due to increased costs over renting, reducing mobility, etc), and never see those gains. I own a number of properties, but personally rent. I don’t want to buy a place to live in, unless I could rent it out and break even, as I enjoy my mobility. Unfortunately where I live, it is not possible to buy and easily rent it out to break even (ie, rent equaling mortgage payment + taxes + property management + maintenance + HOA). In an A class area, most residents can afford to buy, and do whether it makes financial sense or not. Therefore everyone is betting on property going up. I live in a $450,000 property and pay $2,900 per month rent. Calculating taxes + HOA in this are would be $1000 per month. Mortgage interest on a 97% loan on the property would be $1,450 per month. That leaves $450 per month to pay for maintenance, property management, and insurance. It is part of a huge apartment complex, probably owned with institutional money looking for a very low yield. I could obviously buy with a larger deposit, but that seems like a waste of my capital. I can get better returns at lower risk elsewhere. To buy the property above, if I move out and don’t sell, I probably don’t even break even. If I move out and sell, due to real estate transnational costs, i need it to have risen at least 10% to cover my closing costs (when bought plus when sold). Now if the next Airbnb, Uber, Facebook, and Google happened to be invented in the next 5 years within 50 miles of my home, I am crazy not to buy today. People who have owned for the past 15 years in San Francisco got very lucky being in proximity to Silicon Valley. The other 97% of American likely won’t make millions from owning their own home. 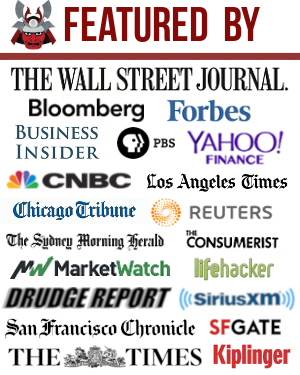 Have you checked out what’s happening in San Diego, LA, Seattle, Portland, Denver, New York, and Miami besides the SF Bay Area? You don’t need to make millions from owning a home to make $250,000 / $500,000 in tax free profits. Don’t for get Texas (Austin Houston, Dallas) has seen nice RE price increases over the last 5 years, after having *not* seen as large of decreases during the great recession as many other areas. I am in Chicago. I agree that many markets have gone up a lot over the past 5 years, and many people have made a lot of money. Investing for capital growth feels risky to me. Investing purely for cashflow can be tough, so personally I take a hybrid approach (invest in property that cash flows and hope for appreciation as a bonus). When it comes to real estate, there are too many black and white opinions. “All real estate crashes” or “All real estate goes up”. You can make huge money finding market arbitrage. My favorite strategy is to find up and coming areas that used to be high crime. Locals who grew up in the city can take a decade to realize the crime and poverty moved on, which leaves a long time for an outsider to study crime stats, and realize the potential without the associated stigma. I don’t necessarily want to live in the areas I invest in. I like living in my established A Class neighborhood which really makes no sense to invest in. It may go up, it may stay flat, that’s a lot of money to invest on a hope. Here in Toronto Canada the average detached goes for $800 to 1mil. Most of the properties are overvalued at this point. So renting becomes a better alternative at this point. There are a lot of people here that have huge mortgages and some will pay the cost of their mortgage in interest. In Canada, there is no mortgage interest deduction or $250K/$500K tax free profits though, right? Canada’s housing market looks quite intimidating. I hope your rate cut doesn’t make people go more crazy. At least the US went through a massive correction. There are zero capital gains on the sale of your primary residence in Canada. 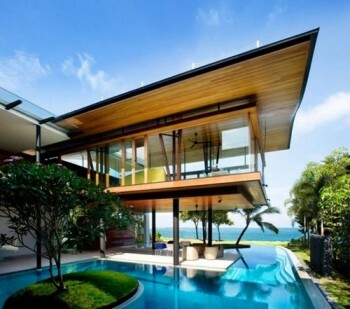 In some cases, it makes sense to declare your vacation home as your primary, which is a nice option to have. Lots of potential profit to be made of you are able to build or add significant value to your property. $0? As in, you buy for $1 mil and sell for $2 mil, you pay zero tax on the $1 mil gain? I didn’t think about your point in this post at all before I became a property owner. Once we do get interested in buying property, sometimes we’re so focused on finding one and strategizing how to be the winning bid that we aren’t even thinking about the potential perks when/if it comes time to sell. I didn’t realize the homeownership rates have fallen all the way back down to 1993 levels. That’s nuts! My ex and I bought a house in 1992 at $239000. We divorced in 2011 and I paid him $239000 for his half. My house is now worth about $558000. If I sell it, would I have to pay tax on (558000-239000)-250000=$69000 in profit ? Or would I be able to deduct the $239000 that I paid my ex ? I hope you’ll help me out. Thanks. I’m 53 and has an 11yo if that makes any difference. If you’ve lived in it for 2 years, you’re entitled to 250,000 tax free profit a single person, 500,000 if married. But can I deduct what I paid my ex for his part of the house from the basis ? Probably not. Did you buy it from him after the divorce was over with actual money? If so, yes the money you spent to buy 1/2 the house would likely be part of your cost basis. More likely, you kept the house as part of the divorce settlement and he got more of other assets to compensate. Then no, it didn’t raise your basis. I’m not an attorney, just have several friends who have been in this situation. I live in Denver and all the real estate pros here keep mentioning 5 years as the amount of time that real estate prices will continue to grow. This is mostly because housing supply is behind the demand curve. I am more likely to agree with you that housing will slow down in 1-2 years. We had a really hot summer market and I see things slowing down here in October as winter approaches. We will see if things heat up again next spring. I’m still a long way from retirement. But owning my home is way cheaper than renting in Nashville. With a roommate, I’m paying less than $700 per month for housing! Property taxes will go way up next time they’re assessed, but I’ll still be getting a great deal. Plus, I’ll own the home within 10 years. And I’m not planning to sell unless I get some crazy offer from a developer. Interesting tax perspective, Sam. Thanks for sharing! I think it really depends on the real estate market which is driven by job growth and supply of housing. For example in Bangkok there are so many new construction projects that have been built and the city keeps expanding, so even though there is job and wage growth rents have been flat to declining over the past 10 years! This is even though condo fees are climbing at a healthy rate. So in markets like this it’s tough to make the argument that rental income is keeping up with inflation. Real estate remains fairly local.